Audio Sequences featuring creative time stretching. Thanks to the new Audio Sequences you can now use samples directly in a composition, without the need to plug in a (multi-)sampler and use MIDI notes to play it. Audio Sequences also let you play samples at a different tempo without changing the original pitch. This is done by slicing the sample into discrete audio events and each audio event is time stretched as needed. You have perfect control over the transients, the quantizing, etc. so any piece of audio can be blended into your composition, even if it's at a different tempo, pitch and groove. Even better: The sample events in an audio sequence are not limited to the original sample! You can easily switch each sample event to play another sample, at another pitch, with another stretch factor. So, for example, you can replace the snares in a sample loop with one of the snares in your sample library, or with a different sound. Last but not least: MuLab 8 also supports extremely high time stretch factors which let you make new sounds out of sample slices also within the MUX Modular synth and effect environment! MuLab for Windows 32 bit now supports for more RAM than the 2 GB in M7: Up to 3 GB RAM on 32 bit hardware and up to 4 GB RAM on 64 bit hardware. More specific undo/redo descriptions for audio DSP functions. Track and rack mute context menu now includes "Consolidate Mutes" which will convert solo states into pure mutes. Sequence editor: when monitoring multiple selected notes or sample events, now they will only be monitored together if these events overlap at the point of the mouse cursor. Previously multiple selected events were monitored together anyway which could be unexpected / unwanted. Now you have fine control. Improved behavior of the Listen To MIDI button in the parameter map editor. Event monitor: Better window size + GUI scale aware. Sequence parts and envelope parts now have a tempo factor which allows to play them at a different speed without touching their content. More detailed diagnostic log info wrt VST plugins, useful for when a VST does not work as expected. Add MuSampla Track: Now does create an empty MuSampla track even if file is left blank. New sample DSP function "Stretch". New sample DSP function "Filter". This filter can do (resonant) lowpass, highpass, bandpass and even twin peaks bandpass and its filter slope can vary from a soft -6 dB/Oct to a brickwall filter slope. 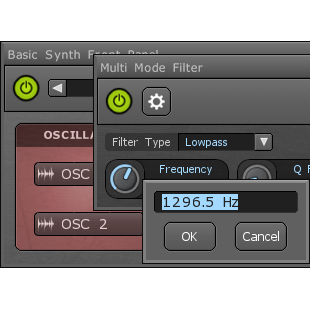 Sampler modules: Start-Loop-End can now be markers or direct sample indexes = More flexibility! No obligation to create markers! Sample -> Add Transient Markers: Now can also work in a selected time region. You can now drop a sample file directly on a sample selector field. This will import the sample in the project and select it. Improved behavior wrt. marker naming: When using a default name, this name now is steady and independent from if other markers are inserted/deleted. Moving sample markers via the time bar now is an undoable action. Deleting markers now is an undoable action. Extra sample interpolation mode: Sinc 8 = Better sound quality than Linear and Spline, but faster than Sinc 16. Waveforms: The "Lowpass" context function has been replaced by "Filter Harmonics" which features much more flexible options to filter the harmonic spectrum of a waveform. Multi-Form Oscillator: New "Harmonics Filter" transform: This new transform method takes advantage of the new harmonics filter for waveforms. The MFO "Harmonics Filter" can be used for dynamic spectral filtering. Multi-Form Oscillator: New "Consolidate" function that renders the current setup into pure waveforms. Sequence Editor has an new timebar context function "Loop Selected Events"
Audio stream parts use this same new fade-in/out method as sample events, which is more easy and comfortable than how M7 did it. In the envelope editors, when double-clicking a point, now the curve parameters are integrated in that dialog, which avoids the extra mouse-click to edit the curve details like in M7. Finalizing long intense MIDI recording with many (ten)thousands of events is faster now. Enhanced speed when using overview files for audio streams. PROJECT menu -> Removed the "Import Sample Loop" and "Import Sample Sound" items because now "Import Audio File" uses the same consistent method as when you would drop an audio file. Audio filters: The frequency response display now shows a more relevant dynamic range which makes that the curve is more centered vertically. When using a MultiMode Filter, now the default module name shows the filter type. Audio Editor: Mouse info display at bottom-right now also shows the sample position. Time units "Frames" renamed to the more familiar term "Samples". Grid named "Bar" will always be a bar grid, whatever its content. Save Project dialog -> Browse -> .Backup.MuProjects files are not listed anymore. Rack desk -> Right-click the [+] button -> This context menu now also has an option "Add Preview Monitor Rack". This will create a new rack named "Preview Monitor" and, cfr M7, all previewing output from the browser will be routed thru this rack, which allows controlling its volume, effects and further routing. When soloing a rack now also racks that send to an aux input of the solod rack are included in the solo. Audio Streams and Samples "Show Info" now also shows the selection info. Project browser: Audio files now have a "Show Info" context menu option. Upon startup MuLab now checks whether it's installed in a writable folder, if not a message alert is shown and MuLab quits. Clicking a on-screen piano keyboard now accurately plays the very note you click on ie. improved the white <> black keys separation. New preference "Open Sub-Menu Delay Time": Sub-menus now can automatically open when hovering them. This preference defines the hold time. In menus and tree lists, pressing the Arrow Left key now also closes the current sub-group even for non group items. This makes it more easy to navigate a tree list using keys only. The "Choose Color" context menu item has been replaced by a more intuitive method using drag-drop to color parts, racks, etc. Color palettes can be reset to the default colors, and can also loaded from / saved into XML files. M8 is more memory efficient especially wrt many little objects like long intense MIDI controller sequences. Finetuned layout and more color preferences. Event List Editor now also uses the global color scheme. Multi-Form Oscillator Layers: The Wave Index Offset column was missing. Fixed. Fixed a potential crash bug when switching projects while a project is being played. Fixed a bug wrt sending MIDI Clock Song Position upon loop. Edit marker: position field could be too small. Fixed. When previewing audio files from disk, but that file was already loaded as a sample (and maybe edited), then that sample was previewed instead of the original audio file. Fixed. Note Dispatcher: Round Robin mode started from the second output. Fixed. Rack -> Render To Audio: When doing it twice for the same rack and overwriting the previous audio file, this could cause unexpected behavior. Fixed. Fixed an issue with MIDI Controller values. Previously MIDI CC values could be anything between 0.0 and 127.0, also eg 123.4, but that sometimes caused practical issues. So now MIDI CC values are pure integers from 0 to 127 like standard MIDI. Also MIDI Poly Pressure and Aftertouch are now using the standard 0 to 127 integer value range. Fixed a sonic issue in the Multi-Mode Filter that could cause little clicks when filtering sounds with a short decay and using high filter resonance. Fixed an issue in the Grain Player when using samples with a different samplerate. Fixed a crash bug when importing a large audio file for which there already exited an overview file. Fixed an issue in the (step-)sequencing engine that could cause double notes upon looping / changing patterns. Fixed a bug that could cause numeric values to go up/down when pressing keys even other than plus/minus. Fixed a crash bug when saving a step sequencer preset while it was also opened in a front panel. When exporting a composition/tracks to an audio file and multi-core is enabled, there could be clicks in the rendered audio file. On certain systems this could even happen during playback. All fixed. Step Sequencer editor now properly reacts on keyboard shortcuts. Fixed a sonic bug in the audio filters when the input signal varies between mono and stereo. MuLab 8 uses a new user key system and currently only works in Demo or Full Mode. The demo limits are listed here. The Oscillator Layers now feature a new "Drift" parameter that emphasizes a vivid virtual analog sound. New function "Repeat Last Context Function". Using this function you can quickly repeat the last chosen context function without going thru the menu again. ADSR: The Bipolar and Legato switches are now integrated in the main ADSR editor and not anymore in a rather 'hidden' sub-panel. Automation part editor: Switching track mute on/off was not reflected in the editor. Fixed. Edit Note Key Names: When typing a new key name and immediately (within 0.5 secs) pressing return/enter to close the dialog then that new key name was ignored. Fixed. New "Shake Keys" sequence function. MUX Front Panels: New "Copy Position" and "Paste Position" functions. Manage Shortcuts: Now has a search function to easily filter and find functions. New "Clear Undo-Redo History" function which can effectively free important memory allocations eg. when having deleted a big VST sample library from a rack. Monophonic Note Tracker: The auto-generated note-offs could be on a different channel than intended. Fixed. Fixed a bug wrt automatic audio recording latency compensation while using "Direct Audio Input". Fixed a sequence part editor issue when using the Note Key Names feature. New "Chebyshev II" audio filter featuring high order lowpass, highpass, bandpass and bandstop. Oscillator and Sample-Player modules now have a "Key Follow" parameter. Editable via the module context menu -> Edit Properties. The "PreferredAudioRecordingLatencyCompensation" audio setup setting has been moved to the standard preferences panel and can now be changed without having to restart MuLab. New Audio Dispatcher module: This new modules routes a single audio input to 1 or multiple audio outputs based on the received note events. So you can play / sequence the audio routing. Great for dynamic sequenced effects! The Waveform "Create Via Harmonics" text-based function has been replaced by the much more graphical "Edit Harmonics" function which edits the first 64 harmonics via drawbar sliders. Fixed a sonic bug in the Mono Delay modules. Fixed a potential crash bug when drag-dropping modules with a parent-child relationship into a Plug-In Slot. Note Dispatcher: When using more than 10 outputs, connections were not properly reloaded. Fixed. Event Monitor was not yet GUI scale aware. Fixed. Fixed a graphical issue with the check mark in menus when using a light on dark background for menus. Plug-In Slot module: The list with possible inserts was filtered depending on the slot's I/O setup, but that could be confusing. Now the list is complete, just like with a rack slot. When saving a project, the previous version of the project file now is renamed to SomeName.Backup.MuProject instead of SomeName.MuProject.Backup. When using the Frequency Spectrum Analyzer in the front panel, the default color for the right channel was different from the modular editor. Fixed. Frequency Spectrum Analyzer: Mouse cursor level display value was not correct. Fixed. Multi-Form Oscillator -> Insert Multiple Sample Grains -> Select sample -> 'None' caused a crash. Fixed. MUX VST: Possible improved behavior in certain hosts when the host deletes the MUX plug-in while the MUX editor is still open. Event monitor now also shows the block timestamp. Composer: In some cases looped sequence parts did not show all events in the part content overview. Fixed. Fixed a bug in the Frequency Spectrum Analyzer when 2 editors of the same FSA are open eg in the front panel and in the modular area. New Frequency Spectrum Analyser module. Modular areas: When connecting modules, now the dragged connection snaps to the closest connectable jack. That's more comfortable. Both the MultiMode Filter as the TF Lowpass Filter now include a frequency spectrum display that shows the filter graph. Added a curve parameter to the Oscillator Super Layers Quick Edit so to have more control over the detune spread. Projects, MUX presets and MuClips can now include creator info. Editable via the context menu. For projects: Project menu -> at the end of the menu = "Show Creator Info" For MUX patches, racks and MuClips: Context menu -> Presets -> "Show Creator Info"
Fixed a problem when using a picture as MUX front panel background. When a MUX front panel background is a picture, the picture now will be automatically resized to match the front panel size. MUX Front panels that are smaller than the window are now centered within that window. (cfr small VST plugins) As a result of that, when you drag the window border of a window with a small front panel then this does not automatically resize the front panel anymore cause that would give unexpected results. In such case you can still resize the front panel via its property panel. (double-click or right-click the front panel background) And to have more control over the window background which becomes visible in such case, each front panel now has 2 extra color preferences "Filler Color 1" and "Filler Color 2". That way even a small front panel in a wider window (due to the top controls) will still look fine. MUX front panel edit button now clearly indicates edit state. Sequence Editor: Improved behavior wrt automatic mouse tool selection when hovering notes. Sequence Editor: When using different MIDI channels per note, the "Choose Focused Channel" function was not working anymore. Fixed. Grid editor: The mouse display showed a percentage value but it's irrelevant in the grid editor. Fixed. MuLab for Windows: Key strokes that are unused by a focused VST editor are now processed by MuLab. Clicking the background of the top control bar of a VST editor moves keyboard focus to MuLab. MUX Modular VST for Windows: Unused key strokes are forwarded to the host. Fixed a stereo signal processing issue in the Pure Delay. At the same time the "Stereo Mode" option has been removed as now the Pure Delay does automatic mono/stereo signal handling like most other modules. Improved behavior wrt sound files with invalid marker data, which could potentially even cause a crash. Fixed. Renamed "Set Beats Per Bar" to "Set Time Signature". Improved behavior in case a VST causes a problem during instanciation. When there are multiple edit fields in a panel, the Tab key now steps thru these fields. Text string fields: Sometimes the selection was not indicated when it should. Fixed. Several improvements which make the GUI more instant and snappy. In some cases while live resizing windows, they were not immediately fully updated. Fixed. Fixed a potential crash bug when lassoing a selection in an empty string display. When opening a project with missing audio files and choosing the Search All option, then in some cases the dialog could get in an infinite loop. Fixed. An important bug fix, too technical to describe, but besides unexpected behavior it could potentially even cause a crash, so it's an important fix. Doubled the maximum supported screen width from 4096 to 8192 pixels. When opening a project containing pitch-bend automation parts, these parts did not show the correct Y axis info at the left of the envelope editor. Fixed. Fixed a memory leak when using the step sequencer as a MUX Modular front panel component. String fields: When lassoing a part of the string, the lasso section was not always at the correct place. Fixed. Insert/Delete Time Slice: Affected markers were not immediately redrawn. Fixed. When opening projects/patches with missing audio files and using the search function, then leaving the Root folder empty could result in unexpected behavior, even a crash. Fixed. Envelope editor: Clicking points now immediately selects that point without a display lag. Fixed a potential crash bug when the modulation system is overflowing. Extended the bounds of the modulation system. Export To MIDI File: Previously only the selected non-muted parts were exported, now all non-muted parts are exported. If you want to exclude parts from the export you can do so by (temporarily) muting them. Fixed a possible little rounding/drifting issue when doing oscillator pitch modulation. Fixed a potential issue with the new Plug-In Slot module eg. using the Oscilloscope in such slot did not sync to the incoming notes. Added a gentle reminder when you inserted your initial user key but not yet your personal user key. The whole GUI now is rescalable up to 200%. See the "GUI Scale" preference. A rescalable UI is relevant for users using high-res monitors and/or who need an increased size for eye comfort. Also relevant wrt touch-screens. Screens are getting bigger and bigger and hence the MuLab & MUX GUI was getting smaller and smaller on those screens. This new feature handles that. New "Plug-In Slot" module. It's like a single rack slot and can be put on a front panel. Preferences panel now includes a search field. Starts searching from the cursor downwards, eventually looping to the start of the list. [Ctrl]+G searches again for the next match. After 1 sec, typing new characters for the search string will create a new search string. Popup value dialogs could be positioned on a improper position. Fixed. VST editors: Finetuned layout when the VST editor itself is smaller than the minimum width for the host wrapper window. Project browser -> Audio Files: Support for selecting multiple files. Renaming Tracks, Racks, etc...: The current name is always filled into the edit field, even when it's using the automatic name. Moving windows via [Alt]+drag border does not limit the window at the top anymore, the window is freely movable. Added protection against resizing the top of a window into the non-accessible area of the main screen, eg. avoid dragging the top of a window under the MacOS title bar area. MuLab top keyboard now takes all width it can take. Step sequencer: When the composition is cycling, then in a very exceptional case the step sequencer could be confused about the start of a bar/beat/loop and hence only start playing the pattern a bar/beat/loop later. Fixed. Dropping an Input/Output module on a rack slot caused a crash. Fixed. Resizing a MUX front panel, making it too small resulted in odd behavior. Fixed. Fixed a potential sonic bug in the noise generator. Added "Right-Click Deletes Notes" preference. MUX VST: When editing meta-parameters, in some hosts there could be an editing lag. Fixed. More detailed log file wrt. diagnosing VST issues. Support for "New.MuRack" preset file: Whenever you create a new rack, then the "New.MuRack" preset file will automatically be loaded if it exists. Sequence Player: When used inside the PolySynth the sequence editor was not showing the play position. Fixed. Event Delay module: When using heavy randomization on short note events, that could lead to hanging notes. Fixed. Inserting or dropping a module, MUX preset or VST into a rack now is an undoable step. At the same time this also fixes a potential crash issue when undoing related steps. When having deleted a Send from a rack and undoing that, the Send's connections were not restored. Fixed. Dropping a meta-parameter on another meta-parameter could cause a crash in specific cases. Fixed. Oscillator: When used outside PolySynth, switching it off/on now resets the multi-layers. Copy-pasting multi-layer setups between oscillators didn't work anymore. Fixed. Fixed a potential crash when opening VST editors. Note Dispatcher module: Overlapping notes with the same key could result in hanging notes. Fixed. Fixed a recent new bug that could potentially cause some playback issues with parallel automation parts. Finetuned rendering of automation and modulation envelopes into controller and parameter events. Previously in specific cases there could be small value offsets. Fixed. As a consequence of the finetuned rendering of automation and modulation envelopes, the "Resolution" parameter has been removed from the Parameter Event Generator module editor. MuLab: Pasting sequence parts now creates unique sequence parts, unless the "Standard Copy Part Is Shared Copy" preference is switched on. MuLab: Double-clicking a MuProject file to launch MuLab with that project file did not properly work anymore due to a recent new bug. Fixed. MuLab Free: Removed the limit on using multi-channel / multi-timbral MIDI tracks. MuLab Free: Removed the limit on the number of MIDI inputs/outputs. MUX Modular VST: Fixed a bug that could lead to crashes upon deleting the last MUX VST instance in the host. MUX Modular VST: Fixed a broken link towards the docs. Fixed a possible crash bug in the VST plug-in scanner. MUX Modular VST: Improved support using MUX Modular VST in Bitwig Studio on MacOS. MUX Modular VST: Fixed a possible little memory leak. MUX Modular VST for MacOS 64 bit! Features all improvements and extensions from M7.1.28 to M7.2.8 thus including the new Grain Player module and much more. Unused keyboard events are forwarded to the host. It still depends on the host how it handles such events. Improved protection against hosts that do invalid multi-threaded UI function calls. Upon opening the editor there could be a black background for a split second. Fixed. Grain Player: Added a new "Playback II" mode: In this mode the effective grain length is independent of the pitch. The "Rounded Corners" preference has been renamed to "Button & Frame Corners" and now has 3 options instead of only 2 before. The default rounding of buttons and corners now is a more subtle one. Added a new preference "Button Gradient Intensity". The more this goes to zero, the more flat the buttons are. The "Audio Level Solid Display" preference has been renamed to "Audio Level Display Style" and now is a percent value so you have smooth control over whether audio level meters should look solid or interleaved, or something in-between. The new default is a quite solid one but with a subtle interleaving. Fixed an audio waveform drawing bug that occurred in certain cases. Dropping a parameter on a meta-parameter did not always popup the meta-parameter map dialog. Fixed. The meta-parameter map dialog did not always close when pressing [Esc] as should. Fixed. While scanning VSTs, even more detailed info is logged to the system log. Upon startup, when opening projects using samples that have changed in length meanwhile, now any updated markers are reported for your info. When ReWire is not installed, this could create an error log. Fixed. Event List Editor: Clicking events only highlighted them after the mouse was moved again. Fixed. Sequence editor: Event Property Panel tooltips were not always the right ones for the selected event type. Fixed. Moving VST editors: Position was not restored exactly. Fixed. Finetuned behavior for editor windows that are too much off screen. New Sample DSP function "Normalize Dynamic". This function can dynamically boost the audio level of samples. For example applied on drum samples this can give powerful sounds. MuSampla and MuDrum: Sample display shows the current play position. Sample Player and Grain Player modules: Sample display shows the current play position. Multi-Point Envelope: Editor now also shows a play cursor. Project Browser: When using the Which field to make a search, now the result list is auto unfolded so that you can immediately see all found items. Right-click on the Rack Desk and Browser buttons at the top of the project editor now allow to toggle between docked and windowed modes. Faster loading of MUX synth presets. Faster rendering of Multi-Form Oscillator waveforms. Added protection against moving windows above the top of the screen so to avoid an unaccessible title bar. Finetuned default preferences for the play position cursor: Smaller size, different color. Text input: Typing characters could trigger shortcut functions for these characters, which is not intended in this case of course. Fixed. Fixed a possible issue with the LFO -> Set Sine function. When opening projects/presets using samples that have changed in length meanwhile, now any updated markers are reported for your info. Project -> Revert didn't report possible info messages. Fixed. Windows: When the left-right mouse buttons are swapped, dragging didn't properly work anymore. Fixed. MacOS: Fixed a potential crash bug when searching for files, eg. in the project browser. Audio markers could be dragged before 0, which could also lead to crashes. Fixed. MacOS version: New "Floating Windows Auto-Hide On Deactivate" preference. MacOS version: Created a practical workaround for Sierra's new 3rd party app quarantine hassle. MacOS version: Fixed a bug wrt the Virtual Keyboard. MuLab for Mac now is an up to date 64 bit application, ready to continue rocking the Mac now and in the future. Several issues with Carbon VST plug-in editors are gone now: No more white windows upon closing an editor, keyboard and mouse-wheel input now properly works as expected. On some Mac systems the previous MuLab 32 bit version didn't launch. Fixed. Improved MIDI output engine resulting in even more tight MIDI timing. Multi-Form Oscillator: Improved and extended "Insert Multiple Sample Grains" function. For example you can now also make wavetables using sample grains that step by step grow in harmonic content eg. keep the grain start fixed but advance the grain end. Also the rendering quality has been further improved. Improved and extended options when opening a project/preset with unfound audio files including an automatic "Search All" option. Sequence editor: Playing the piano keyboard at the left-side can be recorded now, just like the piano keyboard at the top of the project window. Edit note key names: The key field now has previous/next buttons for more editing comfort. When adding a sub-track, that sub-track now defaults to using the parent track's MIDI channel. Added auto-conversion of M6 style audio recorder tracks to M7 style audio recorder tracks. Added an explicit function to switch the keyboard focus to the very VST plugin's editor for in case the VST's own editor does not do that. Drag-dropping an FXB/FXP file on the top control bar of the VST editor loads that FXB/FXP into the VST. When scanning VST plug-ins it is made sure that all relevant scan messages are logged for in case you want to analyze a VST scan issue. Added extra protection against entering invalid parameter values. MFO Sample Grains: Added protection against too long grains which could lead to crashes. Fixed a potential crash bug when changing the loop length of a sequence on 64 bit systems. Fixed a bug in the Key Names sub-system that could make key name setups to be multi-channel by default. In some cases the popup edit field width for inputting small numeric values was not wide enough. Fixed. Recording rack mutes didn't work anymore. Fixed. Fixed a potential rounding issue in sound modulation sub-system which could lead to sonic artifacts and in exceptional cases even to crashes. This fix which now uses higher resolution variables also further raises the overall quality of the whole MUX Modular sound system. On some slower systems or on high system load, very short clicks on push buttons and scrollbars could be ignored. Fixed. When drawing a new part on an empty track, the part type selector popup did not go away by clicking aside it. Fixed. Fixed a sonic bug in the Modulation Mapper in case no source input was connected, but there was audio-rate modulation input for its Amplitude or Offset parameters. Text string editors: In some cases the cursor was not visible. Fixed. Fixed a possible crash bug when editing the Which field in the project browser while also clicking the browser list. 64 bit versions: Bypassed a potential crash bug in a used external 64 bit library. MuLab for Mac: Fixed a possible odd clicking issue with the push buttons. In previous versions, audio recording relied on the modular Audio Recorder module. Although this allows for very flexible recording setups, for users that are used to traditional audio track recording, this modular approach could be daunting. Now MuLab 7 also supports easy traditional audio track recording: Add an audio track, arm, record, done. While the modular flexibility still is there in case you want it. In previous versions audio parts always used a marker as start position. So when splitting an audio part, a new marker was added. When doing many splits this could end up in many markers, which was not very comfortable. In MuLab 7, when splitting an audio part, no new marker is created, but a part specific start point is used. That's easier. You can also still use start markers, just like in MuLab 6, so to manage a common start point for multiple audio parts. Audio parts now also feature a snap marker for easily moving/copying an audio part with a specific audio cue point. For example if you have a vocal audio part that starts with the word "Spring" you can put a snap marker on the "P" so to perfectly align it to the beat. When playing back an audio file with a different samplerate, MuLab creates a resampled version of that audio file. This is more CPU and RAM efficient than resampling the audio file in realtime. In previous versions however, when switching a lot between various audio setups, this could result in multiple intermediate resampled audio files like "SomeName-resampled48000-resampled44100-resampled48000.wav" etc. Now MuLab 7 always keeps track of the original source audio file and will only create a single "SomeName[Resampled].MuWave" that will only be used for playing the original file. At the same time the resampling speed and quality have been greatly improved compared to MuLab 6 thanks to the use of Voxengo's R8Brain resampling library. M7's new Step Sequencer module is a very creative tool to experiment with and generate all kinds of sequences like drum patterns, melodic riffs, chord progressions etc. It features 12 lanes of 32 steps. Each lane can be a single note, a (strummed) chord, or even a micro sequence on its own. Each step can be easily toggled on/off, transposed, etc. When playing the Step Sequencer via MIDI the step sequence is automatically transposed so you can play melodies of sequences, a great way to generate new musical ideas. At the same time the Step Sequencer also features multiple patterns, each with its own loop, and state of the art sync modes that allow realtime switching between patterns and come up with original dynamic sequences. M7's Step Sequencer also features Modulation Groups which let you group certain steps and vary (and automate!) the pitch, velocity and length of the grouped steps on the fly! Supports multiple MIDI channels hence multi-timbral sequences. Unlimited number of pattern, each with its own loop length and step length. Includes 4 lanes for sequencing MIDI Controller/Aftertouch/Pitchbend. Pitchbend features an auto-glide function. Arpeggiator mode with the same creative power and flexibility. Can be driven by another step sequencer, which can be driven by another one... Unlimited creativity. Using the new "Audio To Modulation Converter" and "Modulation To Audio Converter" modules, modulations can now also be done on audio rate. More sonic options as you can route audio to modulation and vice versa. All audio processor modules (filters, delays, ...) can also be used to process audiorate modulation signals. The new Modulation Sample & Hold module samples and holds the input value upon every note-on. New Parameter Value Randomizer module. Upon receiving a note-on, this new module randomizes the selected parameters within a defined range. This also works any VST plug-in! Racks can now import/export the auxiliary inputs and outputs of the plug-in modules in that rack. This results in enhanced support for side-chaining, multi-out VSTs etc. Racks now have a "Freeze/Render Audio" function that will render the audio up to just before the volume fader, as well as any used sends and aux outs. This way you can freeze CPU-intensive plug-ins while still having realtime control over the mix. You can also return to the original situation to make edits to the source and refreeze again. Racks now have an on/off button. This way you have more control over the CPU usage. Grids are now fully user definable. This allows to make your own grooves or extract grooves from audio eg. drum loops. You can also store & recall your favorite grids to the preset library. New "Swing" parameter allows for instantly swinging sequences, resulting a nice human-feel grooves. You can easily set a common swing amount for the complete composition, but also a separate amount per sequence part, resulting in extra groovy multi-swing. Double-clicking notes will delete them. In previous versions this only worked on the sides of a note, but in the new M7 it works on the entire note. There also is a new preference "Right-Click Deletes Notes". Right-clicking a note will delete that note/the selected notes. [Cntrl]+click a note will only be used to copy notes, ie. it will never delete notes. This preference is switched on by default. When you open a project of which some of the audio files cannot be found, you can now use the new M7 built-in audio file search function to help finding these missing audio files. Better looking UI and polished workflow thanks to many subtle improvements, among which a new font and better font rendering. Also delete actions are now undoable, including deleting tracks, racks and plug-ins, thus avoiding "Are you sure?" popup alerts. M7 features an extended sonic palette & even better sound quality thanks to enhanced algorithms. On top of that the factory library has been improved and extended. When inserting a new MuDrum or MultiSampla in a rack, the 3 extra audio outputs will automatically be exported so they're instantly usable as rack outputs. VST Plug-in Manager: Plug-ins now have an "Edit Extra Option" context menu where you can set the preferred num aux inputs and outputs. When that VST plug-in then is inserted in a rack, it will automatically import/export the preferred num inputs/outputs. This preference can be set per VST and is only to set once, then each time that VST is plugged in that preference is used. It's a little time-saver. Oscillator: "AIPS" has been renamed/extended to "Phase Shift Mode". It has 4 values: Off, Source Only, Add Layered, Invert Layered. Off = No phase shifting is done. Source Only = Only the source waveform generation is phase shifted. Then when applying audiorate modulation to the Phase Shift parameter you get true PM = Phase Modulation. (aka FM) Add Layered = The phase shifted version is added on top of the original wave. This results in a similar phasing effect you get when detuning two oscillators. Add Inverted = The phase shifted version is added on top of the original wave, but inverted. This way you can get a PWM block wave by using a saw wave. This mode is the M6 compatibility mode. Multi-sample zone editor: When monitoring a key, then previously zones that were set to output 2 or up were not auditioned. Fixed. Multi-sample editor: When dragging a zone's left/right side, it could end beyond the MIDI keyboard range. Fixed. Improved Sequence Player module now also featuring arpeggiator mode, velocity sensitivity, more sync options. When used in the PolySynth, oscillators do not generate any sound until they received a first note-on event. Event Monitor: Delete key now hard mapped to clearing the display. MuDrum: Upon opening the editor all pads could shortly flash. Fixed. Note To Modulation Converter: Random output now immediately starts with a random value, even before the first note-on. That's more logical as random means random. Finetuned behavior of the [Delete] key in the multi-sample editor. Note Key Ranger: Editing the Min and Max Key now had consistent editing behavior for MIDI keys eg. holding [Shift] will jump 1 octave up/down. Finetuned the looks of the modular area: * Background color = "Main Editor Back Color" preference. * Grid lines take "Main Editor Grid Contrast" into account. * Unfocused cables are more clear, while still preserving a good difference with focused cables. A muted mixer strip does not bypass events anymore. When meta-mapping an Amplifier's Pad parameter, the value display was not going in 6 dB steps but continuously, which was not correct. Fixed. Multi-Sampler: Changed the Low/High Velocity properties to integer values ie no decimal point anymore as that could cause difficult situations. Multi-Point Envelope: When inserting a first point at the beginning you could not zoom out enough anymore. Fixed. Modular area: Alt-click on cable = toggle mute, but when doing this fast it was interpreted as a double-click and thus opening the cable editor. Fixed. Modular area: When alt-clicking a cable = toggle mute, then the respective open cable editor did not refresh its mute field. Fixed. Finetuned the White Noise Generator: The previous version had a little negative DC offset and a rather limited value resolution. The new version has no DC offset and a much higher value resolution. Parameter smoothing is more immediate. Important when doing hard non-continuous parameter automations. Multi-Point Envelope: When loading a preset file and the MPE is in a MUX and its event input is not connected, then it is auto restarted. Multi-Mode Filter: Increased sound quality cause it now uses 64 bit processing. Optimized performance of the TF Lowpass filter. Increased accuracy for all modulations, especially when using non-linear curves. When changing the audio engine samplerate, global LFOs like in the Tremolo patch where not properly updated resulting in a wrong timing. Fixed. Fixed a bug in the multi-sample player: When there were too many layers playing this could result in a "User thread wait time-out error". Fixed. Multi-Sample Player: Tripled the max num simultaneous layers from 4 to 12. Upon selecting a MUX device from the preset list the transpose value was left at the previous value. Fixed. When dropping a new MUX preset or VST plug-in on a rack slot, the MUX/VST editor is automatically opened. Fixed an issue with the send names. Individual mixer strips don't show a solo button anymore as it was inactive. In the modular area, racks don't have redundant outputs anymore. Moving/copying a rack plug-in to another rack preserves any auxiliary connections. Eg you can copy a send from one rack to another and it will be the same kind of send. This fixes the "Send To Nothing" issue in M6. The multi-sample editor now has a fixed height which ensures that the zone properties panel is fully visible. This height is high enough to see many zone layers at the same time. And for the other zone layers you can still scroll up/down. Improved support for different VST input-output pin arrangement types. Audio level meters: "Max Level Fall Down Time" preference was not interpreted right when audio engine's samplerate was not 44.1 kHz. Fixed. Audio Envelope Follower and Level Compressor: Improved processing of stereo signals. Compressor module: Finetuned layout + fixed a mismatch wrt. the displayed curve. Audio Envelope Follower: The "Use RMS Window" switch was not preserved. Fixed. Audio displays: More accentuated color difference between selected and non-selected audio. Added protection against connecting a module with itself. Rack names that are not fully visible are now instantly shown in a steady tooltip just above the rack. Fixed a crash bug when drag-dropping a module onto a rack slot that contains module that contains the dropped module. Multi-Samples can now be saved independently from a MUX as separate preset files. When dropping an audio file on the multi-sample editor, the created zone was selected but the properties pane was not updated. Fixed. Fixed a bug when inputting parameter value text strings. Fixed a bug when using meta-parameters where the minimum value equals the maximum value. Fixed a possible app freeze when dropping a module into the modular area of one of its own deeper modules. Multi-Point Envelope editor: When dragging the start/end loop flag, sometimes dragging was obstructed in an odd way. Fixed. The Pure Delay module now has an On/Off switch. When inserting a module into an effect slot in MuSynth, MuDrum, MuSampla and MultiSampla, that module's editor now is immediately opened. Fixed a crash bug when switching the Multi-Point Envelope to an empty preset envelope or deleting all points. Fixed a couple of potential crash bugs in the automation/modulation system when doing extreme automations/modulations ie. using high frequency loops and/or complex shapes. For such cases use audio-rate modulation. When a VST editor requests a window resize to make the window smaller, then it could happen that the top control panel (with MuTools' open/save/option buttons etc) was not fully visible anymore. Fixed. Fixed a potential problem wrt. the patch data not being restored/saved upon opening/saving the host project. Added a couple of stability protections wrt. hosts using an ambiguous VST implementation. You can now set exact parameter values by double-clicking a parameter value which pops up an input dialog. New "Import MIDI File" and "Export MIDI File" functions for individual sequences. 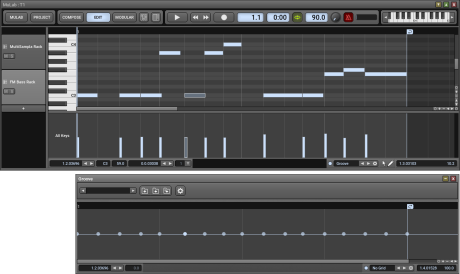 You can now drag-drop a MIDI file onto the sequence editor, that will merge the MIDI file into that sequence. Dropping a MIDI file on the browser when it's at Sequences + This Session will import the MIDI file as a new sequence. Sequence input field now also accepts dropping MuSequence and MIDI files, for example in the Sequence Player module. You can now drop samples directly onto MuDrum pads, that will load them into that pad's MuSampla element 1. Audio Envelope Follower now has an On/Off switch for its 1ms RMS window. New preference "Use VST Program Name As Default VST Name". Floating Windows Bar: The window buttons now toggle between show and hide. And a right-click closes the window. Each VST now memorizes its last bank/program file path, so next time you load/save a bank/program for that VST the browser will start at the last location. Improved behavior when loading sessions with registered VST plugins of which the DLL has been moved to another location. Session browser -> "MIDI Files" and "All Files" now also have relevant options for the Where field. Optimized speed for certain sequence functions especially noticeable for sequences with thousands or more events. Sequence Player module now has an On/Off switch. Modulation Monitor now also includes a text display that displays the modulation value. Improved the way how the display string and default value is defined for the modular meta-parameters. It's simple now: The defaults are defined by the first parameter mapping for that meta-parameter. To control this, the meta-parameter map editor now supports pushing a mapping to the top. Top keyboard has scroll left+right buttons. Clicking the time bar to set a new play position now has instant response. Mixer strip modulation mode changed to multiplication. Fixed an issue with the tooltips while dragging objects around. Shortcut to Shortcut Map -> Edit wasn't working. Alt+click on integrated sample display didn't monitor the selection. Fixed an issue when feeding overloaded values in certain curve transformations. When saving a MUX preset that includes the Sequence Player Module, the used grid now is saved too. In some cases the browser was unintendedly changing the list position. Undo-redo of editing an envelope point via a popup dialog was not working. Fixed a possible sonic bug in LFOs and looped Multi-Point Envelopes. Modular area: Lasso selecting multiple modules and dragging them could make only a single module to be dragged. New: Each MUX module can have its own custom note key names. These key names can also be imported and exported to a text file. Sequence parts: New "Consolidate" function which renders the loop into a new straightforward sequence and deletes any unplayed events. New function: Sequence -> Delete Double Notes. New function: Sample -> Reload. Increased the number of events that a VST can send to the host in a single process slice. Doing track -> "Choose Target Module" and dropping a module on a track to set its target are both undoable actions now. Scrolling and zooming can now also be done using keyboard shortcuts. Event Monitor now also has an event output, events are simply bypassed, but this way the Event Monitor is more usable in a rack. Event Monitor now also has a On/Off switch, and when switched off it pauses monitoring. Audio Envelope Follower: Improved algorithm for converting the audio envelope into a modulation signal. Much more accurate now. The level meter of a mixer strip (of a rack) now is draggable and represents the mixer strip module. MultiSampla: Pitch and filter LFO & ENV Amplitude defaults to 100% instead of 0%. Composer, note editor, multi-sample editor: Shift+click+drag upon a part/note/zone now starts a selection lasso. Browsers: Clicking an object/file previewed it, but only once if it was not already highlighted. Now each click previews it again. While moving markers in composer, audio- and sequence-editor, then the current marker position is displayed in the info box. When saving a preset file using a file name that differs from the object name, the popup question alert now explicitly includes both these different names. File browsers: More file browsers now memorize their last location. Improved support for changing the samplerate or blocksize during a session. MuLab: Finetuned behavior when doing Audio Setup. Previously the whole session was reloaded, including all plug-ins, which also caused editors to close etc. Now the session stays intact and only when the samplerate has changed or blocksize has increased then all plug-ins are updated. MUX Modular Plug-In: Demo version now properly fades to soft noise instead of fading to silence (almost silent noise). Sample -> Replace function: Fixed an issue with the markers. When moving rack slot modules, the process on/off tool tip could show an irrelevant "Num Voices". Pasting a module into a deep modular editor using a keyboard shortcut pasted the module at the far bottom-right of the editor, which was not intended. Now the pasted module is positioned at the mouse position. Fixed an issue with the MUX Modular presets not showing the proper icon in the browser. Fixed a broken link to the docs wrt "Couldn't save user settings". Fixed a problem when inserting a new MUX meta-parameter map line. Inactive audio recorders still created a little empty audio file. Non-resizable windows had the "Edit Size" in their context menu, which was irrelevant. Mixing desk open/close state setting was not saved. Lists: When mouse was at top or bottom item, list could unexpectedly make big jumps. Fixed a possible crash bug when inserting a mixer strip into a rack. MUX Modular Plug-In: Fixed a bug that could cause a crash or a hang when clicking the keyboard in the multi-sample editor. Fixed an issue with the play position line. OSX: Fixed a graphical bug in several editors, eg the inactive part in the note editor was not properly darkened. OSX: Fixed a packaging mistake which caused MuLab to be launched for the first time using improper default settings. MUX Modular Plug-in: Clicking the main plugin window background in the MUX Modular specific part (not the host specific part) ensures keyboard focus to MUX Modular. MUX Modular Plug-in: Browser now also stays floating just like module editor windows. Better position for the popup list for the sequence- and multi-sample value fields. New synth module: "Multiform Oscillator". Supports creating, importing and using wave tables in a high-quality and modular way. See this intro video. MUX Modular Plug-In: All MUX-related benefits of MuLab 6.0.35: New MuSampla version 2, improved MuDrum, rack slots now include a process on/off switch, improved multi-sample editor, and many more improvements which all together make a big difference! Cfr the M6.0.35 change log below. Audio Files and Samples: New context functions "Add Recurring Markers" and "Delete Selected Markers". New preference "Middle C Index" allows you to set the middle C to C3 or C4 or C5. Default is C4. REX file loader: Improved protection against exceptional/wrong REX files. In some cases when deleting multiple objects at the same time, only some of them were effectively deleted. Fixed. Factory Library Folder and User Library Folder are now editable preferences. This allows for a more customizable setup. Docked part editors that auto-follow the focused track. Direct buttons for showing/hiding the browser, mixing desk and session modular area. New "Export Consolidated Session" function for making a complete session folder for export to another system. New "Export Tracks As Audio Files" function which exports each main track as a separate audio file. All rendering-to-audio functions can now be interrupted by pressing ESC. Audio parts now give you full control over the fade-in and fade-out curves and show these curves on the audio data. Audio parts: When changing the gain or stereo pan in the part property panel, this is applied to all selected audio parts. Sequence parts: When changing the transpose or velocity in the part property panel, this is applied to all selected sequence parts. New "Add New MuSampla Track" function. New "Insert Time Slice" and "Delete Time Slice" functions. New "Select Similar Sequence Parts" function. New "Increase Tempo", "Decrease Tempo", "Half Tempo" and "Double Tempo" shortcut functions. Sequence editor now has two tools: The standard arrow tool (cfr M5) and the pencil tool which makes it easier to quickly insert and delete notes with a single click. Sequence editor now has an event property panel for quickly changing the (selected) event values in an alternative way. With optimized undo/redo support so to avoid redundant undo/redo steps! New "Transpose -1", "Transpose +1", "Transpose -12", "Transpose +12" sequence shortcut functions. Envelope editor now has an envelope point property panel, similar to the event property panel in the sequence editor. Audio-, sequence- and automation editors now much more clearly indicate the active/inactive region. Improved Event List Editor: Better layout + events that are outside the actual play region are grayed. Event Graph Editor: Support for individual note keys, which is handy to select the velocities of a certain key. MuDrum sampler plug-in slots now also have an explicit On/Off button. MuDrum: Pad editor is switched also when playing the pads. MultiSampla now has 4 stereo outputs so you can route specific zones to a separate output. Modular Feedback Delay now has a "Invert Feedback" switch. Rack slots and module buttons now include a process on/off switch. Multi-sample editor: Zone editor now integrated as a docked sub-editor. Added support for note key names e.g. for when a target module defines C3 as "Kick", D3 as "Snare" etc. All embedded sample displays (e.g. in MuSampla and in the multi-sample zones) are fully functional now. New "Focus Previous Rack" and "Focus Next Rack" shortcut functions. These functions make it possible to also use MuLab as a stage rack with a bunch of preset racks that can be selected via MIDI. Improved curve editing: Curve edit fields (e.g. in the Audio Balancers) now support direct editing i.e. (alt+) drag up/down to change the curve without having to open the curve editor. Opening the curve editor is done via double-click. Plus other detailed improvements wrt curve editing. Improved and extended browser functionality. Added support for saving/reloading the sample markers near the source sample file. Optimized audio engine which should result in less drop-outs when high CPU load on certain systems. Many more preferences so to tune MuLab to your flavor. Many more improvements which all together make a big difference. See below. Added support for a factory Start.MuSession which is opened and auto played on initial startup. Support for a 'Focused Track'. "Add Automation Sub-Track" now also includes Controllers, Pitchbend and Aftertouch. MultiSampla now also has a Pitch Bend Range control. All sample editors: The marker displays now include a previous+next marker button. When moving the vertical column dividers in the event list editor, the display was not properly redrawn. Fixed. When editing a value and you can select the value via a popup list, then the current value now is clearly indicated. The left sides of audio- sequence- and envelope-editors all have the same width now in all cases. That makes it easier to align editors. 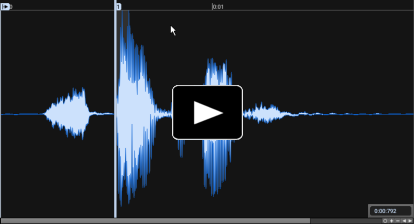 Audio parts now each memorize their own editor position + zoom. Fixed a problem when dropping a MuClip on the sequence editor. When adding racks while the music is playing could result in hanging notes. Fixed. Event Graph Editor: When drawing a line to draw/edit a curve, the line color was always black even on dark backgrounds. Tuned. Event graph editor: Fixed a problem with selecting velocity beams in certain specific cases. When double-clicking envelope points, the popup editor didn't take the part start time into account. Fixed. A single click on an envelope point does not create an undo step anymore, as that was a redundant undo step. Sequence editor takes some extra space at the right into account so to easily manage any markers (e.g. loop-end) at the end of the sequence. "Auto Collapse/Expand Racks" now is a standard context function and not only accessible via shortcut and right-click on the collapse/expand rack button, but also via right-click on mixing desk background. When focusing modules (e.g. racks), also the modular area reflects that by solo-selecting the focused module. When switching presets for rack slot modules, in certain situations the rack was not properly updated. Fixed. Fixed a problem with the User/Settings sub-folder after having manually deleted the User folder as a kind of setup reset. Enhanced interaction between the Step Recorder and the Sequence Editor. VST plugins: When clicking the editor top name display, that popup list will now highlight the current VST program. Preference names now includes spaces and dashes so to be more readable. Mixdown Audio split into "Export Composition As Audio File" + "Render Selected Parts As New Sample". Fixed a play bug when looping the composition that caused that certain notes (the ones crossing the part's end) were played upon loop while they should not be played. When splitting a unique sequence part and the "Standard Copy Part Is Shared Copy" preference is 1 (= yes = true) then the split will use shared sequences. Ensured that the preferences window never needs horizontal scrolling to read the description. The "External Audio Editor" setting has been moved to the Preferences. Importing MP3 audio files now is interruptible by pressing ESC. Fixed a nasty crash bug when copy-pasting a MUX device (e.g. MuSynth) inter-session when such MUX device was using samples as well as using effects in the device FX slots. When using "Save Preset", "Save Preset As" and "Delete Preset", the browser now is automatically refreshed. When recording parts and the part is put on a collapsed track then that track is automatically made visible. Editors: Shift+click-without-drag on background = select none. When importing an audio file or sample loop, now the resulting part is put at a better position. VST plugins' "Show Initial Delay" function replaced by "Show Info" which shows more info, including the Initial Delay. Browser now memorizes tree list state in between changing 'What'. Browser: Auto Play button moved at left of progress bar + auto play controls are hidden if not applicable to current "What". Shortcut manager: Explicit "Add" button. Audio editor now includes a little display that shows the current cursor time. Audio editor time bar now shows minutes+seconds instead of frames. Changing the pre/post switch could result in a lot of audio clicks while dragging the pre/post indicator. Tuned. More visible log details when scanning VST plug-ins. When the user settings can't be saved, an alert box is shown which optionally also opens the relevant doc file. Saving color presets now uses a more simple name dialog instead of a full featured file browser. This avoids that color preset files are saved on a irrelevant place. "Main Editor Grid Contrast" and "Piano Key Lanes Contrast" preferences moved from Edit Looks to Edit Preferences. Browser: "Where" field now shows a tool tip when the text is not fully visible. Clicking the timebar in the automation envelope editor now snaps the new play position to the selected grid. When there are tracks with no target module, then moving the play position could result in unexpected controller/parameter changes. Fixed. Floating windows bar now always shows the option button so that you can close the bar if it's not needed anymore. Inserting/removing a modular input/output did not redraw the parent MUX modular area. Fixed. You can now also drag-drop audio files on the [+] track button which will add new audio/sample tracks. Fixed an issue when dropping multiple audio files onto the composer. Oscillator: Octave, Transpose and Fine Tune are now indicated as bipolar parameters. ADSR: If it's about a bipolar ADSR then all level parameters are now indicated as bipolar parameters. ADSR + Multi-Point Envelope: Velocity Sense is indicated as a bipolar parameter. Multi-sample editor: Several other improvements. Text string displays: Initial auto select all. Text string displays: Cursor only visible when focused. Step recorder fields are more aligned. Fixed a bug with resetting the MUX preset file cache. Fixed a bug wrt tooltips while dragging knobs and sliders. By default the UI focus box is not drawn anymore. It's still a preference, only the very default has changed. Removed the DoubleClickDeltaTime preference. Now the double-click delta time preference of the OS is used. It was possible to accidentally create feedback loops in the modular area. Fixed. MUX "Deep Editor" renamed to "Modular Area". Term "Locator" renamed to "Marker". "Edit Looks" renamed to "Edit Colors" and extended that dialog. It also includes all device colors now. All Mu files will be a bit smaller in size. Fixed a rare bug which could result in unexpected note lengths when the composition loops from loop-end to loop-start. Fixed a rare bug in the sequencer engine that could cause audio clicks under high CPU pressure, or even rare crashes. Fixed a samplerate problem when rendering a sample from the selected parts. When using mono legato the filters are now also properly applying key tracking. The Multi-point Envelope velocity sensitivity was not working correctly. Fixed. 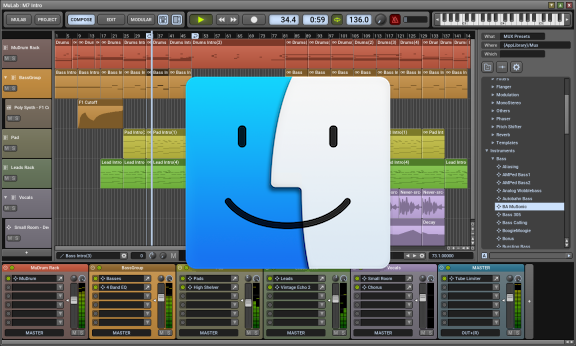 OSX: Fixed a problem with certain VST editors turning white. OSX: After having clicked on VST editors clicking in the main window only activated the window without actually processing that click. Fixed. MUX VST: Added a workaround for a possible crash problem in Steinberg hosts e.g. Cubase. MUX VST: Added a workaround for a resize problem in Steinberg hosts e.g. Cubase. MUX VST: Fixed a possible UI lag problem when using multiple MUX VST plug-ins. MUX VST: In some hosts, in certain situations where note-ons and note-offs are sent on the same time, there were hanging notes. Fixed. New "Audio Pos/Neg Splitter" module. More subtle and less dense time bar. Windows: Default Audio Setup now uses MME Sound Mapper. Windows: "MME Audio" renamed to "MME Audio Output". New preference: DefaultAutoScroll defines the default value for the auto scroll feature of the editors. When deleting a module that is a track's target module, the track header was not immediately redrawn. Fixed. Sometimes small tooltips were displayed incorrectly vertically. Fixed. VST plug-ins "Edit In Generic Editor" function not shown in context menu when the VST plug-in has no parameters. For details, see this doc page. The popup list for rack slots now also contains all relevant modules so these can be used directly without the need for a wrapper MUX. When docked browser is minimized, the "Show Browser" function will make sure it is not minimized anymore as that could be confusing. Composer, Note Editor and Multi-Sample Editor: When hovering the start/end of a part/note/zone, the cursor now shows a left-right resize cursor, which is more appropriate/standard than a pencil cursor. When recording new parts, the newly recorded part becomes the only selected part. MultiSampla: Clicking the multi-sample display didn't popup the multi-sample list. Fixed. Audio Editor: Right-click on time bar -> "Create Locator" caused a crash. Fixed. Audio Editor: Right-click on time bar -> "Set Locator" wasn't properly working. Fixed. Increased the VST MIDI input buffer size. Windows: New preference "WindowsProcessPriority" which allows to set a higher process priority on Windows, resulting in a more solid audio engine. Improved support for multi-track audio recording. Automation parts can now also do MIDI controllers, Aftertouch and Pitch Bend. Support for looped automation parts. Easier handling of automation & modulation envelopes. New sequence function: Quantize Notes 50%. Mixdown dialog: Added a button to quickly set the From-To to the composition loop. New "Modular Feedback Delay" module which can have any module in the feedback path, even a MUX, even a VST, even any combi of those. New "TF Lowpass Filter" module. Wobble Modulator: New "Curve" and "Alternating Offset" controls resulting in more control over the resulting wobble. Modular editor now supports lasso select to move, copy and delete multiple modules at once. Improved editing of oscillator super layers. Samples: Added a "Create New Sample From Selection" function. Floating Window Bar gives more control over the floating windows. Preferences can now be edited in a user friendly way from within the app. See MULAB menu -> Edit Preferences. Many other little improvements in looks & functionality. MUX Vst: While browsing for an audio/sample file, preview was not always working. Fixed. When having loaded an MP3 or REX file then changing the audio and saving it, now it is ensured that it is saved as an AIFF or WAVE, for MuLab/MUX can't write MP3/REX files (yet). New preference "ConfirmDeletes": If off then non-undoable deletes are performed instantly without confirmation alert. Fixed a specific play bug in the sequence player module when note-offs and note-ons were on the same time. Fixed a potential problem wrt exporting MIDI files. Audio Envelope Follower: Attack & Release parameters were not behaving properly. Fixed. Note that this fix affects previous sessions that use the Audio Envelope Follower. Please eventually re-set these attack and release parameters so it sounds as you want. Audio Envelope Follower: Attack & Release parameter displays are more accurate for the first small values above 0.0. Envelope editors: Indication of the loop points now is done using locators. Session Browser: Whether in docked or windowed mode is an app-level preference now. Removed the Tempo Synced Mono Echo from the module list as it has been superseded by the Modular Feedback Delay. Audio Limiter: Finetuned parameter displays + added visual feedback in the editor. Fixed a bug that caused that MUX front panel background pictures were not found sometimes. OSX version: Sometimes the window borders were not properly reflecting the active/focus state of a window. Fixed. Level compressor and Audio Envelope Follower now also have an event input jack for parameter automation. When the source component of a tooltip is deleted, the tooltip is deleted as well. Fixed a potential crash bug when applying DSP functions on audio. Automation parts: Play position line always visible, also after last point. Mono Echo module: The minimum delay of 1 sample is taken into account in the parameter display. Fixed a button mismatch in the multi-sample player editor. VST editors: When opening a VST plugin editor for the first time, and the VST editor is bigger than the screen, it could be that the window title bar was not visible. Tuned. Locators: Right-click "Delete" does not use a delete confirmation anymore. Fixed a possible crash bug when previewing muclips. When applying DSP functions on an entire sample, then Undo was not working. Fixed. Improved VST engine: Resolved a possible incompatibility issue with certain VSTs e.g. Drumatic. Improved VST engine: When mixing down compositions with multi-core enabled, there could be sonic artifacts e.g. when using Sforzando. (Should be) Fixed. Very short clicks on the keyboard in the top-right could result in hanging notes. Fixed. Very short key presses on the virtual keyboard could result in hanging notes. Fixed. Fixed a M4.5 read session file incompatibility. Track -> Choose Target Module: Improved indication of current selection. Envelope editor: When a vertical grid is set, drawing new points could be off grid. Fixed. Added fix code for MuSynth AIPS legacy incompatibilities. Pitch Bend values are displayed as percentage i.e. -100% to 100%. Little UI focus tweak in the MultiSampla editor. Fixed a practical issue with dragging parameters around on a MUX front panel. Fixed a potential crash bug in the UI system. Not sure if the bug could actually occur in any previous versions. Track -> Choose Target now uses a more relevantly filtered list, depending on the implicit track type. Audio part editor now also indicates where the part ends. Improved mute-solo buttons: They now use the uniform button looks and even better indicate their (dependent) state. Extended drag-drop support: Now you can also drop modules onto module-specific edit displays for example the Record From and Output To displays in an audio recorder. Fixed a graphical bug in the 'Mixer Strip' editor. Removed redundant test log info that was written to the clipboard on startup. Fixed a possible crash bug when loading (MUX) preset files that contain an error. Reworked UI system resulting in a better looking and more uniform look & feel. Redesigned all factory devices: MuSynth, MuDrum, MuPad, MuSampla, MultiSampla, MuVerb and MuEcho! Factory device colors can be easily customized. Oscillators: All super layers (cfr "Fatness") can now be edited in detail, resulting in many more sound options. Such osc layer setups can also be copy-pasted and saved as presets. MuSynth and PolySynth now have a polyphony setting. New "Monophonic Note Tracker" module with which you can do retriggered mono mode. Factory Devices also available via the Browser -> MUX -> Factory Library. Automatic conversion from MuVerb 1 to MuVerb 2. Renamed the "Stereo Echo" factory device to "MuEcho" for uniformity. MuDrum editor: You can also right-click jacks, just like in the deep modular editors. Improved the multi-mode filter response. Improved "Drum Note Processor" editor. Editable colors for the factory devices. MUX deep editor now also includes the preset display/selector at the top. Module process on/off button now shows a standard power on/off icon. The voice count now is shown in the tool tip. Larger modular jacks, thus easier to connect. Disabled parameters (e.g. filter "Gain" when set to lowpass) are drawn in a ghostly way instead of fully hidden. Added support for copy-pasting parameter values, as well via the context menu, as well via drag-drop. Audio recorder editor: Improved layout. Recorded part(s) are automatically selected. Added protection against VSTs that send events that are outside the valid time range. "Insert User Key" dialog uses a more wide input field and also shows an already inserted key. Session mixdown setup is also stored in session file. MUX Vst: Added protection against improper reported sample rates by the host. Improved factory library. Also thanks to Andreas! Audio file -> Rename Source File function was not working accurately when the new file name already existed. Fixed. When muting a MuSynth/MuPad/MuSampla FX slot, and moving the module away from that slot, then this left a confusing virtual mute on the FX slot. Fixed. When mixing down, MuLab now returns "kVstProcessLevelOffline" to the VST "audioMasterGetCurrentProcessLevel" opcode. Important for the behavior of some VST plugins during mixdown. Dropping a multi-channel MuClip on a new track properly sets the new track's MIDI channel to "Per Part". In certain situations, note-offs that happened at the same time as a new note on, did not get prioritized. Even more they could be a sample frame too late. Fixed. Fixed an issue in the shortcut system when using certain 'Specific' target functions. Fixed a bug wrt popup menu font sizes e.g. in case user had set a "MenuFontSize" preference. Fixed some crash bugs in case dropping things on the composer while no composition is selected i.e. when composer shows "No Composition". Fixed a rare potential memory leak. Finetuned and fixed several aspects of the audio level compressor. Extended support for different types of WAVE files. Mixdown start-end is only set automatically on first time, after that it's purely defined by the user. Composer and Sequence Editor: Zoom Selection, Copy Time Zoom and Paste Time Zoom are now shortcuttable functions. Rack naming: If loaded from a preset, the preset name has more priority than the first plugin name. New preset file function: "Unlink From Preset". Improved VST engine especially wrt VSTs that rely on timing info from the hosts. Improved support for rack desk shortcuts when the rack desk is docked. Fixed a bug that could cause audio noises, especially on OSX. "Select Composition" function: When used via a shortcut, the popup list was displayed in the bottom-right corner. Fixed. Audio File -> Create New Sample From Selection did not update the samplerate of the new sample. Fixed. Fixed a little issue wrt the session editor window size when loading sessions that were saved with another editor window size. Fixed an initialization bug that could have various consequences. One known consequence was that e.g. the Shortcut Map context functions were not listed in the shortcut target function list. The multi-function shortcut feature now is a advanced user feature only. Set the "SupportMultiFuncShortcuts" preference to 1. Extended log info for better diagnosing certain problems. MUX Vst now properly reports the effective host samplerate to VST plugins. New sequence part function: Trim To Played. Visual feedback of input and output levels and compression curve. Important bug fix/improvement wrt the Knee parameter. Several other improvements wrt the processing algorithms resulting in a more solid and smooth compressed sound. Audio level meters now show the current max level in a tool tip. Audio level meters now have independent fall times for the maximum level indicator. Composer: When splitting unique parts, the split part is also unique. Fixed a rare crash bug when inserting a new module in a rack or MUX deep editor. Fixed a bug wrt MIDI event processing for system MIDI messages like Active Sense etc. Fixed an issue wrt music time calculations, for example visual in looped sequence parts that were not drawn as looped. OSX: Fixed a MIDI input bug which could lead to missed notes or hanging notes etc. Added a "Edit VST Initial Delay" function, available in the deep editor options menu. Browser: Doesn't show the redundant "Switch To Docked Mode" anymore. Fixed a crash bug when doing "Close All Module Editors" when VST editors are open. Fixed a problem when replacing a VST plugin by another VST plugin while having opened a generic VST editor for that plugin. Increased stability of the VST plug-in interface. OSX: Fixed a problem with drag-dropping external files into MuLab / MUX. Removed the "DroppedAudioFilesLengthThreshold" preference and replaced that decision logic by an explicit popup choice dialog. So when dropping an audio/sample file on the composer you get an explicit choice how to use this audio: As a streamed audio file, as a pitched sample or as a sliced sample. Also when dropping audio files (Aiff, Wave, Mp3, Ogg) into the browser more appropriate logic is used. New "SampleFileLengthWarningThreshold" preference, in seconds. If you're trying to load samples that are longer than this preference, a warning question will popup. Default = 300 secs = 5 minutes. You can now also drag-drop audio files and samples below the tracks in the composer so to create a new track with this audiofile/sample. Fixed+tuned the behavior of the browser splitter. More explicit coloring of selected items in lists. More explicit darkening of the inactive region in the sequence and envelope editors. Fixed a possible little problem with drawing notes on odd grids. OSX: Fixed a couple of issues in the MIDI IO engine. A couple of little optimizations. Finetuned a couple of aspects in the library. You can now also drag-drop MuClips into a MUX deep editor. When editing individual envelope points the time field did not use the envelope grid to step to the previous/next time positions. Fixed. Finetuned behavior when pasting envelope points on grids like 1/24th. Fixed a couple of coloring issues wrt custom front panels. Fixed a potential crash bug when loading presets into the Multi-Point Envelope. Added a bunch of preset shortcuts to the package e.g. Undo, Redo, Select All, etc. Fixed a problem wrt using push buttons. Implemented a workaround for a VST implementation bug in Ableton Live 8. Tightened certain aspects in the MuTools VST interface (plug-in side) resulting in a more stable interface. Enhanced Automation & Modulation Envelopes. Enhanced Support For Designing Your Own MUX Front Panels. New Note Key Ranger module. ADSR envelope has new "Legato" property. When you insert a module (Rack, MixerStrip, ...) in the session MUX and name it "Preview Monitor" then all previewing will be routed to that module, so this way you can control the preview volume and/or add effects to it and/or define to which output it should go. Samples: New "Replace" context function. New "Upgrade MUX Presets" function in MuLab menu. Doubled the number of meta-parameters to 32. You can now drop Rack and MUX presets onto a track header. If the track indeed targets a Rack or MUX or a rack with a MUX in the first slot, the preset will be loaded. MIDI controller names can be user defined via MuLab/User/Settings/MidiControllerNames.Txt, format: "25=My CC Name 25" without the quotation marks. New shortcuttable actions: Goto Last User Position, Goto Composition Start, Goto Loop Start and Goto Loop End. New shortcut to close all module/plugin editors. New shortcuttable rack desk context function "Collapse/Expand All Racks". Smart Bypass for VST plug-ins. Alt-click on the border of a window now allows repositioning the window. (while simple click still resizes a resizable window). Audio files, samples and VST plugins now all have a context menu "Show Info" which shows the relevant details of that object. All MuTools module parameters are renamable i.e. not only meta-parameters. More accurate undo/redo descriptions for the audio DSP functions. Extended & tuned the factory library. Faster loading of presets especially big presets like MuDrum presets. File/folder browser: Favorite list now includes Desktop + Factory Folder + User Folder. Session menu: "Toggle Automatic Manual MIDI Input Focus" now shows a proper toggle icon in front so to indicate the current state. By default the UI focus is not changed by hovering an UI component. It's still a preference that can be changed though. When unresolved shortcuts are found they're removed and the shortcut database is updated so you'll only get the message once. When cut/copy-pasting parts inter-session you now get a question "Also copy the target module(s)?" with options Yes and No. Auto-quantize recordings is off by default. Legacy composition names "Unnamed Composition" are filtered out, so it will use the default naming, which is the same name as the session. Grid control now also supports mouse wheel. Audio Recording Setup panel now includes a "Setup" button that opens the Session MUX. Logical Selector also reacts on Escape. List views (e.g. browser): When text is not fully visible, full text is shown in a tool tip. Finetuned management of the part editor windows. New/Open Session: Finetuned button texts. Shortcuts editor -> Specific -> Some groups contained double entries. Tuned. Windows can be dragged above the top of the screen, if you want. This might be necessary when having large editor windows on small screens. New preference: DragDoubleClickDetectorMoveThreshold. By default that's 5. Finetuned the very default file selector location when saving a preset file. Enhanced audio filter algorithm resulting in even higher audio quality. LFO editors (also in MuSynth): Alt+click steps back in the wave formlist. And also the mousewheel can be used to select waveforms. More compliant hover cursors for UI splitters and window resizing. Optimized memory management resulting in a quicker UI response, especially when loading sessions and presets. Extended the process bounds of the modulation system. New/Open Session question alert now also has a "Cancel" option. Finetuned the "Upgrade Sessions" function: More user friendly to use. "Save Session OK" dialog only comes when used via a shortcut. Color picker now includes 3 little sliders that show and handle the H-S-L parameters. You can also use the mousewheel inside the H-S-L fields. MUX -> "Show Preset Info" now uses a floating window instead of a modal window. MIDI controller names now include the CC number. Envelope parts show play cursor also after last envelope point. Improved support for Rack presets e.g. you can now directly drop a rack preset on a MUX deep editor etc. Event Monitor can now also be used inside PolySynth. Main "Panic" function now also resets the MIDI input note manager. When only 1 composition in session, and unnamed, then it defaults to the same name as the session. When there is only 1 composition in a session, the session window only shows the session name and does not include that single composition name anymore. When recording a new sequence, no name editor pops up anymore, but sequence is name "Recorded Sequence". You can rename it whenever you want. "Revert" session context function is grayed when not available e.g. after New. Rack Desk now has a "Paste" context menu for pasting a rack that is copied to the clipboard. Rack Desk context functions now also are shortcuttable. Deep Modular Editor context functions now also are shortcuttable. When copying racks (via ctrl-drag or copy-paste), the copied rack's output now is set to the default rack output. Clicking the waveform name in a oscillator also pops up the waveform list. When dropping a MUX preset/VST plugin onto a rack slot, the rack takes the MIDI focus. Sample context menu now also includes "Edit". Sequence Parts, Sequences and Multi-Point Envelopes now also have the standard Open/Save/Revert/Delete Preset functions. On dropping something, the UI focus is moved to the drop receiver. Fixed a little display bug wrt the session name in the session window title bar. Fixed a practical problem where undoing/redoing an audio file edit could not be performed because the audio file is opened in another app at the same time. Fixed a problem with undoing edits to certain types of audio files. Different editors: Clicking the zoom in/out scrollbar buttons did not do repeated action, only once. Fixed. Fixed a bug in the Composition -> "Split Per MIDI Channel" function. Fixed a problem in the Rack Desk when expanding/collapsing racks. Fixed a problem when using < or > as shortcut keys. ASIO setup: When there were more inputs/outputs than could be displayed on the screen, there was a practical problem. Fixed. Fixed a scrolling problem in the sequence editor. Fixed an issue in the VST plugin manager when renaming VSTs. When minimizing or resizing the main session window, the rack desk scrollbar was not showing up properly. Fixed. When loading a session or preset with a VST plugin that is not found, the "Locate" dialog kept on popping up even when selecting the proper VST plugin. Fixed. Fixed a bug in the ReWire engine. Fixed an issue in the logical selector where not all criteria fields were fully visible. Deleting envelope points via right-click -> "Delete" was not undoable and popped up an alert, which was all unintended. Fixed. Fixed a little issue in "Upgrade Sessions" that caused folders to be treated as a session file itself. Fixed a potential little memory leak in the drag-drop system. VST editors: When a vst editor is resized by the vst, the top panel width was not matching the vst editor width anymore. Fixed. Fixed a couple of issues in the VST plug-in manager. Fixed an automation part playback bug which occurred in special cases. Fixed a potential crash bug when drag-dropping certain things around e.g. MUX presets onto a MUX editor. Added crash protection against a possibly missing LibResample.Dll. "Auto Scroll" switch now is saved with the session. Fixed a memory leak issue when using the clipboard. Fixed a sonic issue when automating modules in the polysynth while no voices were playing, which could result in unexpected little clicks on the very next voice. Increased stability on 64 bit systems <=> fixed an unreported but potential crash bug. Renaming a parameter that is used in track automation now properly updates the track header. Fixed a couple of issues wrt the Audio Envelope Follower and Modulation Monitor. Added explicit "Upgrade MUX Presets" function. When audio files don't match the audio engine samplerate, they're resampled automatically without question alert. Fixed a bug when loading/upgrading MuLab 3 session files. You can now copy-paste selections of audio files/samples directly into an oscillator. Improved session "Save As" dialog. Waveform -> "Open" now previews the audio files while browsing. When there is only 1 skin, no redundant "Choose Skin" option in the menu anymore. "Make Unique Sequence" is disabled when the sequence already is unique. Improved MIDI input controller support. Finetuned and extended the preset library. In some cases "Show Clipboard Contents" didn't show the most detailed info. OSX: When doing "Move To Top-Left" for a window, the apple title bar now is taken into account. Fixed a bug when using parent modulation towards the PolySynth. Fixed a bug w.r.t. using VST synths in a MUX, then such saved MUX preset was not categorized as an instrument preset. Fixed a bug which could cause different kinds of problems in the 64 bit version. "Audio To Note Gate" renamed to "Audio Envelope Follower" and includes a modulation output. Improved the "Save Session As" dialog. Finetuned the "Manage Audio/Sample Files" function. File path editors are much wider by default so to display more of longer file paths. Mixdown To Audio File dialog: File path editor now also previews audio files while choosing one. Improved keyboard handling while the virtual keyboard is on. 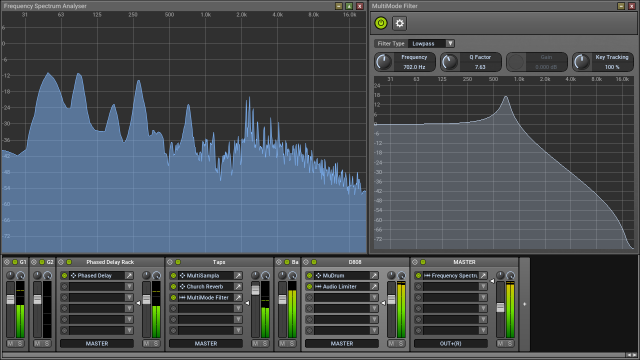 By default VST parameter values are shown as % values, no mixed situations anymore. More relaxed checking of the user key e.g. line breaks in the key are filtered out. Event Monitor now has a "Clear" context function. Text string editors: Shift+Home selects from start to cursor, Shift+End selects from cursor to end. Tweaked several aspects in the UI. Fixed a little bug that caused an improper focus box in some situations. Audio Envelope Follower now properly saves Key and Velocity properties. OSX: Fixed a couple of quirks in the file browser. When editing a parameter mapping, Cancel did not restore the original values. Fixed a little bug in the object naming system. UI splitters didn't show a hand cursor anymore. New Note Key/Vel Filter module. All windows now properly do maximize/restore. So after a maximize you can restore to the previous position/size. Double-clicking a window title bar also does maximize/restore. On Windows, when clicking the MuLab window button on the taskbar, the MuLab window now properly minimizes/restores. Finetuned a detail in the module parameter handling resulting in even smoother parameter slides via UI or automation. Finetuned MuLab Free/XT product limits. Finetuned an UI detail in the parameter drag-drop system. Fixed a bug in the parameter modulation system which caused individual modulations to be unintendedly bound to the [-100% - +100%] range. Fixed a crash bug when editing a sequence part with no sequence. Finetuned Multi-Point Envelope: Now only starts auto-playing when event input is not connected. Fixed a bug in the VST plugin manager when there were more than 1 plugins with the same name. Fixed a bug in the "Upgrade Sessions" function. Improved multi-monitor support on Windows. Shortcut system: For MIDI Controller shortcuts you can now define a value range so that it can only trigger a function on e.g. MIDI button down. VST plugins can now also be opened with the generic editor. New wonderful Fairlight Syn Vox emulation preset by Andreas D.
Finetuned support for external drag-drop. MUX Play Editor renamed to Front Panel. MUX Front Panel: Removed "Edit Looks" from the context menu as it's not yet functional. MUX Deep Editor: Meta Parameter section now has a regular scrollbar instead of those 2 scroll buttons at the right. Renamed remaining "Wet/Dry" parameters to "Dry/Wet" so all of them are consistent. Finetuned auto MIDI focusing when activating a module editor window. Sample context menu: "Embed Into Session" renamed to "Embed". Because it also applies to preset files. In some cases, popup menus could contain empty group elements. They're removed now for user friendliness. Finetuned the Stereo Echo UI. Event Delay module: In the meta-parameter map editor and in the List Editor etc, the displayed Delay Time value was not the right one. Fixed. Shortcut Manager: When editing a shortcut, then doing Cancel, then the shortcut list was not refreshed to display the original values. Parameter Event Generator: When changing connections while editor was open, the parameter list was not updated. Fixed. "Drag Last Tweaked VST Parameter" didn't work towards the MUX Front Panel. Fixed. MUX Front Panel: When opening a VST editor using a module button, that VST editor didn't have the top controls with prev/next program etc. Fixed. The Sampler and MultiSampler modules now properly save their pitch depth and portamento settings. Fixed a couple of potential problems wrt the 64 bit version. Info menu -> Tutorials link was broken. Fixed. Fixed a possible memory leak when using audio parts. Deep Modular Editor: When holding [Ctrl] to erase a module, cursor didn't always show the proper eraser cursor. MUX Front Panel: When customizing the layout and resizing the top/left/top-left of a component, the component was not repositioned as requested. MUX Front Panel: When dropping modules the module button sometimes had an odd color. When constructing a custom MUX Front Panel layout, you can now resize group frames and module buttons by mouse via the component borders. Note editor: Just quickly touching a short note won't make this a trigger note anymore. Multi-point envelope: When used outside a PolySynth and switched ON again, the envelope is restarted. Finetuned VST plugin manager resulting in better support for VST 2.4 plugins since less chance that they are marked 'disabled'. When opening an editor that is larger than the screen (e.g. when the session was saved on a different system than the one on which it's loaded) then it's ensured that at least some part of the window border is visible so you can access the window's context menu. Event Delay: parameters weren't properly reacting on automated meta-parameters. Fixed. Deep modular editor: "New Path" now also properly auto-arranges the new patch. Fixed a bug that could cause a crash in certain situations. Multi-point envelope: When switched to "Seconds" then on reload the grid list was in "Beats". Ring Modulator: When both inputs are stereo, the output is proper ring modulated stereo too. Ring Modulator: When input 1 is stereo and input 2 is mono, the output now is proper ring modulated stereo. Fixed a bug when loading presets that were saved on a 64 bit system. MuLab for Windows: Both 32 bit and 64 bit versions. MuLab 64 bit not only gives you much more memory space for using large sample libraries, it is also a bit more CPU efficient. "Add New Audio Track" now also monitors the audio file while browsing. You can now rename VST plugins apart from their DLL name. "Super Modulator" renamed to "Multi-Point Envelope". Improved labeling of VST inputs/outputs. When opening a template or demo session, you must first use 'Save As' to save it under a specific (new) name. When dropping a new parameter onto a meta-parameter, then when you 'Cancel' the Edit Mapping dialog box, no new mapping is added. When adding an automation track, but no parameters are found, now an auto-hide alert informs you about this. "Revert Preset" now includes a "Are you sure?" alert. Event Delay: Delay Time display includes the units. 'Replacing' a VST plug-in by another VST plug-in while the VST editor was open caused a crash. Fixed a possible crash bug when drag-dropping VST parameters. Tool tips: In some cases an empty tool tip was shown. New Parameter Event Generator module. New MIDI Controller Generator module. Dropping a sample on a multi-sample player adds a new full range zone for that sample. MUX Front Panel: Module buttons can get a fixed color, fixed to the PE layout, independent from the module color itself. Waveforms => Rotate function: Input value is expressed in degrees instead of samples. Envelope parts are also user renamable. Finetuned the default output for new racks. "Basic Effect" preset now includes a simple gain parameter on its Front Panel. Increased flexibility when reading unconventional MIDI files. Fixed a possible crash bug when inserting new instrument tracks etc. while the music is playing. Fixed: When deleting a rack the [+] rack button in the rack desk stayed at its old position. In certain situations, Import Audio File, Import Sample Loop and Import Sample Sound could use an inappropriate rack. Move-drag a module from a preset device into a deep editor not possible anymore. Copy-drag still works though. Musical resolution increased from 1200 to 12000 PPQN, sample accurate. Improved timing when recording MIDI events and parameter automations without quantization, especially when using a larger audio driver buffer size. Smoother movement of the play cursor when using a larger audio driver buffer size. Rack Desk now also has a [+] rack button, cfr tracks. Mixdown dialog: In case of mixdown to audio file, there is a little button with which you can quickly set the target file to the session master audio file. VST plug-in manager now shows more details while scanning, especially in case of errors. Improved the session MUX audio and MIDI input/output modules: Now you can choose the effective in/out device pins to be used. Session MUX Audio Inputs/Outputs now use the effective audio device jack names by default. Session MUX: removed the irrelevant modulation input/output from its module list. Module editors are now 'toggled' i.e. when an editor is not open it's opened, when it's opened but hardy visible, it's focused, else it's closed. This also applies to the Session MUX editor. File path displays now show the full file path in a tool tip. You can drop files on a file path display so to set it to that file path. File browsers: You can drop files/folders on it so to set it to that file/folder. Improved importing of track / sequence / instrument names when loading MIDI files. Recent Session list is now alphabetically sorted on file name instead of full file path. String fields now use a more clear way for showing the cursor and selections. Now that MuLab has handy tools to collect the used audio files in the session audio folder, the need to first save a new session before audio recording has gone, and so that specific alert has been removed. User movie recorder: Various improvements. New preference "DoubleClickDeltaTime" in number of millisecs. "Edit MIDI Input Focuses" renamed to "Edit MIDI Input Channel Targets". And the "Target Module" label is renamed to "Focused Module". Finetuned the MIDI input channeling behaviour. Finetuned default output selection for new racks. Audio Recording Options dialog: various user interface improvements. Unused reloadable samples are auto deleted from the session. Level Compressor: When process switch is off, only audio in 1 is bypassed. Added protection against dropping a MUX into its own deep editor. Sequence editors also support track function shortcuts. Fixed: When doing 'New Session' while the audio recording dialog was open then MuLab hanged. When inserting / removing audio recorders in the Session MUX, the Audio Record Setup panel is also immediately updated. Fixed a problem with audio/sample file references when there were similar folder names near each other. Fixed: When Fatness/Detune/Spread was tweaked as a MUX Meta Parameter, the corresponding oscillator editor was not updated. Fixed a problem when renaming an audio file recorder from within its editor. Fixed a crash bug when using e.g. "Per Event" MIDI channels, then selecting that part and playing the focused module keyboard at the top right. When multiple audio recorder dialogs were open for the same audio recorder, changing the Chans (Num Channels) or Nrmlz (Auto-Normalize) was not reflected in the other. "Trim To Selection" now taken into account on save sample. Fixed a sonic problem when intensively modulating a filter with sharp modulation edges. Fixed an internal ambiguity that could lead to potential crashes. Updated the Basic Synth factory preset. MuVerb factory presets updated to MuVerb 2. User movie recorder now also includes indication of left/right mouse clicks. Note editor: When drawing new notes, and the mouse drag ended at the left of the start point, no new note was drawn. Now things are working 100% as the preview outline shows. Note editor: When drawing new notes, the length indication in the bottom-right info display was not correct. Possible problems fixed when ending audio recording. Fixed various problems with the user movie recorder. You can make a custom Front Panel with session parameters/editors. You can use session-level meta-parameters. Simplified MIDI controller mapping hierarchy. Session MUX Editors can be hidden to the dock. The whole session can be transposed. New "Split Per MIDI Channel" composition function. This function also is automatically used on importing MIDI files. Includes a filter that colors the reverb only. Decay Time up to 100%. Instability parameter transformed into Turbulence Amp + Speed. Finetuned audio alert when crossing limits in MuLab Free/XT, using a soft noise instead of a (creepy?) voice. Audio Lab: [Alt]+click = monitor selection/slice. Drag-dropping a module on a track now preserves the target MIDI channel. The event outputs in the Session MUX are auto named to the respective MIDI output port. Track -> "Choose Target Module" function back in play. Targets default at MIDI channel 1 instead of 'none'. So e.g. when recording a new audio track, the track's MIDI channel is set to 1 instead of "Per Part". MultiSampla now is velocity sensitive by default. AudioBalancer 1->2 and 2->1: Gain parameter modulation now uses multiplication instead of summing. Finetuned auto-focus module behavior, especially in the modular editor. Finetuned UI of indicating selections in a list. Composer/Sequence Editor Grid Panel: When popping up the grid list, actual grid is clearly indicated. Finetuned loading of M3 sessions. Racks: Mouse wheel events that occur inside the same vertical area as the mixerstrip do not scroll the rack desk for otherwise this may unintendedly change the volume/pan sliders. Dropping a VST parameter on a MUX meta-parameter caused a crash. In some cases, when loading another MUX patch, dependent Front Panel were not properly updated. Fixed several editing issues wrt using multiple MIDI channels per track. Session -> Manage Audio Files didn't work as intended. Fixed. The 'Output' setting of multisample zones was not loaded/saved. MuLab Free/XT: When user had 8/16 VSTs in database (exactly the limit) then on quit the product versions webpage was still shown. When popping up the patch/module list, the MUX patches didn't have an icon. While dragging envelope points the envelope wasn't played. More transparant, effective, easier and enriched modular architecture. New MuSynth VA synth module. New Note To Modulation converter module. New Controller To Modulation converter module. New Aftertouch To Modulation converter module. New PitchBend To Modulation converter module. MUX and PolySynth now can have a variable number of inputs and outputs. MUX and PolySynth can also have modulation inputs. You can use a modulation input on the PolySynth to input global LFO which will be common to all voices. Oscillator, SamplePlayer, MultiSamplePlayer, NoiseGenerator: Volume parameter now uses a more relevant 'multiplied' modulation. Oscillator, SamplePlayer, MultiSamplePlayer: New Pitch parameter (replaces the Pitch Mod Depth). Oscillator, SamplePlayer, MultiSamplePlayer now have rich portamento features. Improved the oscillators' pitch modulation code resulting in even better sound. Oscillator now has 300! accurately selected and hi-quality waveforms. Thanks to adventurekid.se! Oscillators now have the option to start at fixed start phase from 0 to 359 degrees. MultiSample Player now has 4 outputs. Each MultiSample zone can be routed to 1 of these 4 outs. The Main Audio Input + Output modules (the one that stream from/to the audio device) can be used anywhere, in any modular level. Now using logarithmic slopes for a natural sound, other slopes possible too for broad sonic creativity. Much higher envelope times possible. Continued smooth sound on changing/automating the envelope times. Switchable between unipolar and bipolar. Frequency and Amplitude is modulatable. Now also have a crossfade curve. Now also has a Process On/Off switch. Filter Mod Depth parameter has been removed, use mod cable Amplitude or Mod Mapper. Improved modulation cables now use a more relevant Amplitude + Offset properties instead of Min-Max values. Same for the Modulation Mapper module and the Wobble Generator. Besides the standard MIDI controllers, now also Aftertouch and Pitchbend can be used to MIDI control parameters. Deep Editor now uses full featured meta-parameter editors on top. Meta-parameters now use similar auto naming as tracks etc: if no explicit user name, then an auto name is used. You can drag-drop parameters on a meta-parameter so to add/edit that mapping. Finetuned the GUI of many module editors. MUX Front Panel is much more customizable: You can drag-drop parameters and editor buttons onto it and move them around. Also support for group frames. New "Revert Preset" function for modules. All modules have a Open/Save Preset context function. Streamlined "Save As" for patches: Always using a file browser. File browser will open in the most relevant location. Racks now have direct parameters to its Gain, Stereo Pan, Stereo Width and Mute. Racks now use plain knobs to control stereo pan and stereo width. Hundreds of new inspiring patches. Windows version: Optimized performance: MuLab 4 uses up to 35% less than MuLab 3! Greatly improved support for working with sampled drum loops. Slice and dice, rearrange, quantize, process the individual slices of your sample loops! The "Part Targets" feature has been removed. This simplifies the concept without loosing anything essential. For it is still possible to set a separate MIDI channel per part. You can even use separate MIDI channels per event! Tracks and parts now evaluate the target channel apart from the target module. Sub-tracks can overwrite the midi channel of the main track. Parts take the midi channel of the track, if any, else they can have their own midi channel. Events take the midi channel of the sequence part, if any, else they can have their own midi channel. 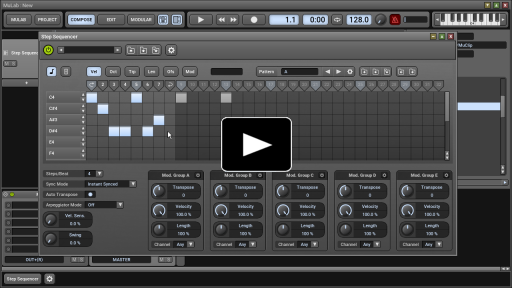 Composer has a + button with feature-rich Add New Instrument Track / Add New Audio Track / Add New Track options. Composer and Sequence Editor have an integrated grid panel. Extra preset grid: "MIDI Clock". New way for editing audio, sequence and envelope parts using floating windows. New way to draw parts and to indicate selected parts and unique/shared sequence parts. New Focussed Target Module Panel always shows the module that is played by the MIDI keyboard. The Part Property Panel is moved below composer. Audio Parts now have a gain-pan-fadin-fadout play parameter. Sequence Parts now have a key+vel play parameter. Improved Mute/Solo behaviour for tracks. Finetuned context menu for track mute. Finetuned the algorithm to define the destination track when recording a new part. Greatly improved the Audio Recording Options panel. In the sequence editor, when moving the loop-end locator, you get a set of nice options how the new loop should be filled. Increased resolution of the Event Graph Editor from 128 to 1024 with a minimum of 10 ms between value. Improved the "Modify Time/Length/Value 1/Value 2/..." sequence functions. Fixed: "Thin Out" sequence function reported a wrong number of deleted events. Optimized sequence functions sub-menu, resulting in a more effective context menu. Reworked Drag-Drop sub-system opens many options. For example: Drag drop a module on a track = Set Track Target! You can drag-drop modules with [Ctrl] to copy them. Drag-drop module on the "+" track button = create new track for that module. You can drag-drop modules and parameters on (envelope) parts. You can drag-drop a module onto the Focussed Target Module Panel to explicitly play that module from MIDI input. Open and play multiple sessions at the same time. Cut-copy-paste and drag-drop parts and modules from one session to another. Racks and modules can now be colored. The colors are used by the tracks and parts targetting the module. This makes a visual link between the composition and the sounds/effects. Improved behaviour when doing "Reset Graphic Resources": Also all module editors now properly reset themselves. String valuators: double-click = select all, cfr standard behaviour in most software. When showing the source file path of audio files, relative and absolute paths are shown, if different. Tab key has been freed from hard-coded behaviour. So it's freely usable as a shortcut key. (Control + Tab still is reserved for stepping thru the open windows though). Right-click anywhere on a rack to popup the context menu. Knobs and sliders now step to more default values on Alt+click. Meta parameter editor: Minimum and Maximum values now use the effective parameter values. Modulation cable property panels are non-modal floating windows. Modulation cable property panels now use knobs with clear value displays. When selecting an output for a rack, all relevant inputs are shown, not only racks and output interfaces. You can directly drop a .Mux file onto a rack slot. The Session Modular Area window includes the session name. Font icons better match the accompanying text and color. Rack slots also show the module icon. Individual rack slots can get the GUI focus and this can process shortcuts. Optimized and beautified module editors. More skinning options for the audio level meter. Finetuned editing of parameter values. Right-click Play button -> "Panic" function for quick access when needed. As a note: The Panic function is also shortcuttable of course. Clicking Play while the audio engine is not running now gives a friendly alert with the option to go to the Audio Setup. [Alt]-click on slots, modules or cables = toggle mute . When loading a patch, sample or waveform from outside the library, you can now simply step to the previous/next patch, sample or waveform in that folder. Oscillators: You can drag-drop a wave file onto the display. When activating a synth editor, then the MIDI focus also is auto switched to this synth. VST plugin manager: multi selection possible => easier grouping. Imports MP3 files as samples. "Save Session As" now uses a new method: MuSessions are saved in a separate folder so that the Audio subfolder becomes more private per session. This will make it more easy to bundle a MuSession into a zip. New options to to manage the audio/sample files within the session's audio folder. Rack Sends popup menu now also include 'Copy As Parameter Event'. Tuned new VST naming algorithm: MuLab prefers to use the VST patch name rather than the VST plugin name, if relevant. MuLab now supports opening sessions via the command line. Fixed: When saving a session in some parent folder of the library folder, then there could be a file reference problem when loading the session on another system. New "Save As 'New' Session" function. Inline Sample Browser: You can step thru the samples in a folder while the music is playing and using the selected sample. For example: choose a snare drum sample while the drum pattern is playing it. Fixed: When your computer was up and running for many days without restart, then there could be some practical problems. Finetuned management of sequenced sustain pedal events. And many many other micro improvements, too many and too detailed to list them all. "Upgrade Patches" context menu for MUX and MuSynth. When mapping MIDI controllers to parameters, now this always works, i.e. also on sequenced controller events! Previously this only worked on MIDI input. Finetuned organization of MIDI controller mappings i.e. clear separation between the global session map and the local plugin maps. Finetuned playback behaviour when using sustain pedal events i.e. notes are cut off on stop. Disabled auto-looping for imported samples. MIDI controllers that were sent to a rack were not properly mapped by the first module in that rack. In certain rare cases there could be a little panning issue in the audio. When quickly retriggering playback of audio files while moving locators, the audio could be out of sync for a moment. OSX: When launching MuLab with logging enabled on startup, the app could hang. The file browser now allows to toggle the 'Show Hidden Files' switch. Editable via the Filter button. Windows: MuLab's file browser now does show system files, it only hides hidden files. VST plugins context menu: "Show Initial Delay" . In the MUX and MuSynth, when doing 'Save Preset' the preset list was not properly refreshed. When having edited an audio file in an external editor, "Reload audio file?" was asked multiple times. Sonic bug when re-loading preset loop info from AIFF or WAVE files. Some changes of 3.2.4 where not properly compiled into the OSX version. Added a "Refresh Overview" shortcut function for audio files for in case it's needed. Finetuned the conditions for when an audio file overview should be recreated. "Reset Graphic Resources" now is a shortcuttable application context function. This is only relevant to skin developers. When loading AIFF or WAVE files, any preset loop is properly applied. When doing Audio Setup->Select Inputs/Outputs when the device had more than 32 ins/outs, there could be a crash. When opening a Rack editor while this rack was also visible in the Rack Desk, there could be a graphical issue with the level meter. When your system was already up and running for weeks without restart, there could be a graphical animation problem. Fixed a case where denormalizations could occur. Improved relative file path management when saving sessions and patches. Audio Lab: Audio files and samples now have a bit of extra space at the right in order to see/use any locators at the end. Composer: Finetuned drawing of parts, especially selected parts. When loading a session or a patch file, and there are unfound audio files/samples, then you also have a "Ignore All" option. When creating a new sample from an audiofile selection, the selection locators themselves are not copied anymore for that was redundant. When copying parts, the Part Property Panel was not properly updated to the new copied part. Audio Lab: Applying a DSP function to a complete audio file/sample instead of on a selection didn't work. Modular Editor: Grab existing connection and drag to another connector. Modular Editor: Double-click connection = edit connection properties. Modular Editor: Right-click connection = connection context menu. Modular Editor: Hold [Ctrl] to draw new module or delete existing module/connection. Audio Files now have a "Rename File" context function. Audio Lab: Making/changing selections can now comfortably be done using two special locator handles. 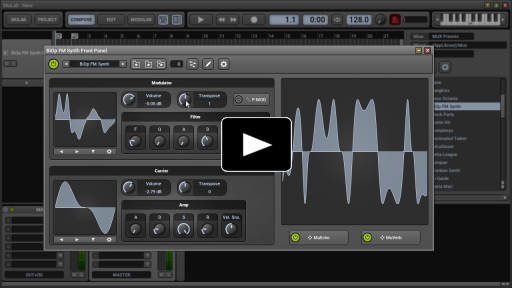 Audio Lab: Crossfade Loop now features multiple crossfade shapes. Audio Editor DSP functions are also shortcuttable now. Beautified drawing of new connections/changing connections. The Session Audio Output module now uses the same kind of editor as the Session Audio Input module for selecting the effective output pins. When opening a session with broken audio file links, then when locating the audio file, the filename is in the browser's title bar as a reference. Less RAM usage when using large audio files. Faster generation of audio file overviews. Modular Editor: Also module icon is shown. Yes-No alert now also reacts on [Enter]+[Return]=Yes and [Esc]=No. Cut/Copy Parts moved to part context menu. Note Key Splitter: Outputs give a detailed tooltip. Finetuned behaviour for 'Rewind' while playing. Modular Area renamed to Session Modular Area. MuLab gives a proper alert on loading shortcuts to unknown functions (if any function name would have changed in a new app version). Audio Lab: Normalize, Gain, Gain Fade and Mute are now undoable when applied to a sample. Audio Lab: Finetuned the Normalize and Gain dialogs. When recording audio, the resulting audio part will by default be an auto-named part. When renaming an audio file, also the .Ovw overview file is automatically renamed. PitchBend events didn't get thru a Send module. When deleting racks, after having reordered racks in the rack desk, the rack order could be distorted. Issue in the auto-naming system. Composer and Sequence Editor: Possible scroll problem just after the window was resized. Sequence Editor: In certain circumstances, the editor view was changed when having edited another sequence. A full reinstall is necessary. To keep your current settings, copy your MuLab 3.1.x User/Settings/*. * files to the new MuLab 3.2.x User/Settings/ sub-folder. MuSession files created with MuLab 3.2 are not downward compatible i.e. you cannot load them into MuLab 3.1.x or lower. In some cases recorded audio did not get a proper audio input latency compensation. Auto-name for samples don't include the file extension anymore i.e. file name only. In some case, e.g. when moving sequence parts, there could be a sudden sound burst. Recorded audio could have a little delay in front of the recording. WIN: MME audio engine: bug in initializing the CPU measuring system. This could also cause unexpected 'Overloads' on startup. Issue that made that no 'Rack' was shown in the module list. In earlier versions of MuLab you could only record 1 mono or stereo track at a time. Now with MuLab 3.1 you can record 1, 2, 5, 12, 20, ... mono or stereo tracks at the same time! In earlier versions of MuLab audio was always recorded from the audio input. Now with MuLab 3.1 you can route the audio input thru an effect and record that instead of the dry input. Or you can record the output of a VSTi, or a ReWired device! You can record audio from any point in the session signal flow! With MuLab 3.1 you can use the inputs and outputs of your audio device with maximum flexibility. For example, you can choose to use the e.g. 8 inputs of your audio device as 8 mono inputs, or you can choose to use them as 4 stereo inputs, or any possible combination! Same for the outputs. Which also allows you to make complex monitor mixes, or setup other types of advanced routings! In earlier versions of MuLab, when you imported an audio file with samplerate 44.1 kHz while the audio engine was running on 48 kHz, then the audio file was played with a different pitch because of the samplerate difference. Now with MuLab 3.1 audio files with a differing samplerate are automatically and non-destructively resampled resulting in a perfect pitch preservation! The new "Audio To Note Gate" module dispatches the incoming events to 12 outputs based on their note key. Very useful to build drum patches! It might look a small improvement, but it definitely increases your visual comfort while creating music! Audio Files and Samples: "Add Locators Around Selection" context function. Modular Deep Editor: Double-clicking a meta parameter knob opens its parameter map editor. Double-click in time bar creates a new locator. "Select Previous Preset" and "Select Next Preset" are shortcuttable. Double-click in time bar = set position + create locator. When choosing a rack slot send, then you get more target options. Very new default session uses default i.e. auto rack names. When creating a new module in a modular editor, the module list now uses sub-groups instead of dividers. When recording a new track, MuLab FREE/XT also give a proper alert if the newly recorded track(s) are outside the play limit. Waveform display now shows the library name of the waveform (if any). Waveform display now also features a drop down list. Waveform display supports subfolders within the waveform library folders. On opening/pasting waveforms, MuLab now uses a hi-quality resampler so to match the internal waveform size, instead of truncating/padding the loaded/pasted waveform. "Select Previous/Next Preset" shortcuts now also work for VST plugins. Event Monitor: Channel value now between 1..16 (was 0..15). MIDI Input Focusses panel has 2 labels above the columns. Event Graph Editor: sometimes Parameters 1..16 are available when they were redundant. Event Graph Editor: When drawing a velocity line, then if there is a selection, only the selected events are affected. Optimized drawing of modular connections. Shortcut list: Removed some redundant items. Audio files: "Edit In Extern Audio Editor" now also is a shortcuttable context function, and accessible from within composer etc. More specific alert when adding an audio file that is not recognized. Support for alpha-blended text colors. When choosing a preset, the preset list keeps it folded/unfolded states. When choosing a preset, stepping thru the presets goes a bit faster now. MuSynthCore -> Add Module -> finetuned the list. Reworked & improved auto-name/equal-name-indexing system. Whenever a progress bar is used, it's not in system modal window anymore, but a more gently floating window. New.MuSession is looked for in Mulab/User/Library/MuSession. Faster drawing of audio waves, both in composer and audio lab. Audio Lab: Selections now also have a different background color. Audio Lab: Selections can also be lassod from right to left. When monitoring notes in the Note Editor, any selected notes are monitored together. When browsing for a folder only, no files are shown anymore. Faster reading and writing of AIFF and WAVE files. When choosing a session sample, the samples within multisample groups are sorted alfabetically. Note Editor: Short pencil clicks did not always draw a note. Click on rack name now immediately focuses the rack without a double-click detector delay. Click on rack slot now immediately focuses the rack slot without a double-click detector delay. Click on track name now immediately focuses the track target without a double-click detector delay. Right-click empty rack slot -> context menu now also offers "Insert Module". Renaming tracks allowed even if track has target module. Double-click track name edits track name. Right-click on track module icon pops up that module's context menu intead of the track context menu (right-click track name for track context menu). When copying parts to the clipboard, the current target module is properly copied too (track or part target). Record events + selected part + cancel => also had to cancel new name dialog (2x cancel). In some cases the focus box was drawn improperly. Event Monitor showed blank pages. When Sampla editor was open and you deleted that sample, there was a graphical issue. In certain situations there was a little imperfection in the working of the ADSR. When stepping thru the preset list, then once you got into the 'devices', stepping thru the presets stopped working. Bug when writing 8-bit wave files. Bug in the audio file writer, only appeared in special cases. Possible naming issue when moving sends from one rack slot to another. Serious bug when writing large MIDI files (>0.5 MB). Event Graph Editor: Issue with selecting parameters from the list. Crash bug when hitting Esc while drawing notes. When time signature was e.g. 6 beats per bar, dragging locators etc. was still using 4 beats per bar. OSX: Audio error when using an oscillator's AIPS feature. When renaming a module that was used as the output for a rack, the rack's output field wasn't immediately refreshed. Audio Lab: Deleting the part start locator did not immediately refresh the indicative background display. Replacing a module that was used as a track target did not propery update the relevant track(s). A couple of issues with auto-naming. When selecting a track/part, then it could be that its target rack was not properly made visible in a wide rack desk. Problem with pasting parts into another composition.